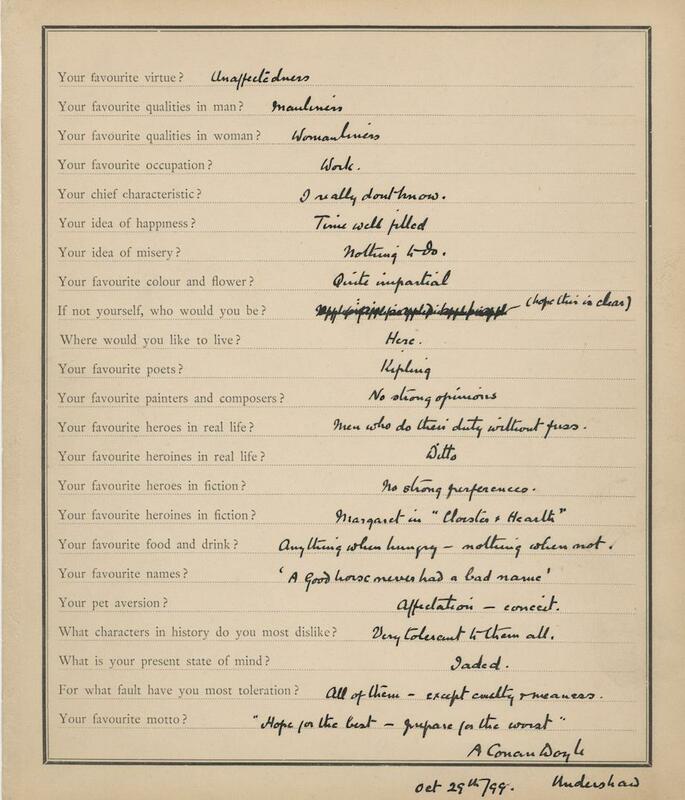 Sir Arthur Conan Doyle: The author's taciturn responses to an 1899 version of the Proust questionnaire. When some of Sir Arthur Conan Doyle’s papers arrived at the Harry Ransom Center at the University of Texas at Austin, archivists found this mysterious questionnaire filed among his other works. Doyle signed the bottom of the sheet and indicated that he had taken the quiz on Oct. 29, 1899, at Undershaw, the family’s residence in Surrey, England. But we don’t know why or for whom he filled it out. Archives assistant Arcadia Falcone, who has worked with the Doyle papers, speculates that the quiz may have been part of a parlor game. The famous list of personal questions that Marcel Proust answered, and that Vanity Fair asks celebrities to respond to in each issue, was a fashionable diversion in the late 19th century. If the parlor game hypothesis is true, it doesn’t seem like Doyle was much interested in playing along. The answers to the questions reveal a taciturn and stolid Victorian nature, with Doyle resisting speculation and elaboration at every turn. Doyle did admit to enjoying the poetry of Rudyard Kipling, whom he had visited personally in Vermont in 1894, and the 1861 historical novel The Cloister and the Hearth by Charles Reade. Thanks to Arcadia Falcone and Jennifer Tisdale of the Harry Ransom Center. Image courtesy of the Harry Ransom Center.